The latest research shows that diminishing Arctic sea ice caused by climate change is forcing some species to travel further to find food or look for alternative food sources. “Polar bears are even showing up on murre colonies. Now, these are cliff-nesting birds,” Kathy Kuletz said. She’s a bird researcher with the U.S. Fish and Wildlife Service, referring to one notable example. Kuletz’s research is part of a new report on Arctic marine biodiversity published by the Arctic Council in conjunction with their ministerial meeting in Fairbanks May 10-11. It describes how melting of the Arctic sea ice also is forcing marine species to shift their ranges further north. It also notes that increasing numbers of southern species are moving into Arctic waters, and it describes an increasing frequency in contagious diseases like avian cholera. In a video version of the report produced by the Arctic Council, Haakon Hop of the Norwegian Polar Institute said the rapid reduction of thicker multi-year and second-year ice is having a dramatic impact on the Arctic sea ice ecosystem. Reduction in sea ice means changes for beluga whale migration. It also creates problems for harp seals, bearded seals and ringed seals when they have their pups or try to raise them. Walrus will haul out on shore rather than on sea ice, increasing calf mortality from possible stampedes and forcing adults to travel further to find food. Kit Kovacs of the Norwegian Polar Institute remembers how the sea ice around the Svalbard Archipelago is dramatically different from just 12 years ago. The absence of sea ice has affected how scientists observe or survey various species. “We’re seeing profound changes, many of which are quite difficult to document because the traditional tools available to us like flying surveys at molting to count seals on sea ice are obviously no longer possible without sea ice,” Kovacs said. Kovacs said they’re observing behavioral changes. Seals, for example, have to travel further to find food, dive deeper and for a longer period of time, and are resting less. Polar bears usually hunt seals on the sea ice. But Kathy Kuletz of the U.S. 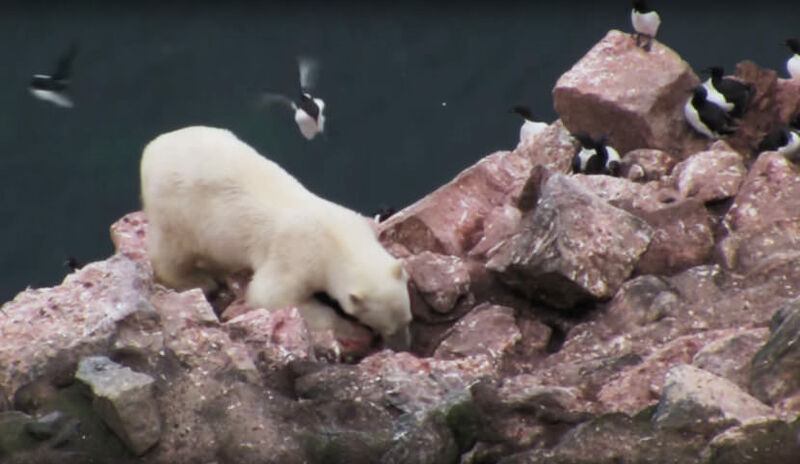 Fish and Wildlife Service said polar bears have been observed foraging for food by going after ground-nesting common eiders or cliff-nesting murres. Connie Lovejoy of Quebec’s Université Laval said they can no longer take data from a particular event and extrapolate to the entire Arctic. For example, higher ocean temperatures may prompt an increase in small, warm water plankton called copepods in one region of the Arctic and an increase of fattier, cold water copepods on the opposite side of the Arctic. While some countries continuously monitor certain species, other countries may only do research that coincides with specific, short-term projects. The 200-page report on Arctic marine biodiversity was produced by the Arctic Council’s Conservation of Arctic Flora and Fauna working group. It incorporates the work of 60 scientists from around the world, including three researchers from the University of Alaska Fairbanks.